Next up in our series of featured MBA bloggers is Embeeay, an MBA applicant with diverse interests and a well-rounded educational/career background who writes at Em. Bee. Ay. Please enjoy reading about Embeeay’s application journey. Thanks Embeeay! 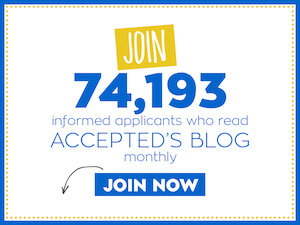 Embeeay: Hello Accepted.com – I bounced around several areas growing up, starting things off in upstate New York, spending a few years overseas, and ultimately settling in New Jersey. I attended school at a U.S. News Top 25-ranked university on the East Coast where I obtained a Bachelor’s in Biology. It isn’t the most conventional major for a prospective MBA student but it just goes to show how your undergraduate major can hardly limit your career direction unless you choose to let it! I completed the degree in 2007 so while I am not considered too old for MBA FT programs, I do tend to feel older than the average applicant, due to the increasingly popular, more conventional route of returning to school after 3-4 years of work experience. Could be just my imagination though. Accepted: Which schools do you plan on applying to? Any safety schools? Embeeay: I am planning to apply to Northwestern Kellogg, Yale SOM, Duke Fuqua, NYU Stern, and a 5th as-of-yet-undetermined school (will be a 2nd-rounder, more research needed). I personally don’t believe in having a “safety” school for my pursuit of an MBA. There’s no question we are in the midst of an education bubble that’s seen tuition skyrocket and salaries flatline. As a realist, I fully understand the branding power difference between a top-ranked school and a lower-tier business school. Thus, I am shooting for a healthy range of schools in the Top 15 that I believe are not only a good fit for me, but trust these schools will bring me the ROI I seek on obtaining the MBA. The lost income for 2 years and the tuition expenses are simply too great for me to settle on a “safety” school. Also as a realist, I am keenly aware of the weaknesses in my profile and do not plan on wasting my time chasing Harvard or Stanford; I am not so sure these schools would be a good fit for me anyways. Accepted: What would you say is your greatest profile strength and greatest profile weakness? Embeeay: My greatest strength would have to be my broad exposure to a variety of fields and international cultures. I have a combination of work experience across both the technology and finance industry, and I have also worked in India, Seattle, and New York City. This gives me a strong and diverse perspective. My greatest weakness is my undergraduate GPA. Accepted: How do you plan on overcoming that weakness? Embeeay: I took up a quantitative-marketing based course over the summer and earned an A. In my application, I plan to dwell not on my weaknesses but focus on my strengths. Embeeay: The honest answer is that I want to go to business school to change careers. I had not pictured an MBA in my future back in 2009 or 2010, or even early 2011. But ultimately, as I began to do my research, I realized that an MBA would open up the world for me, bringing me the opportunities to dive into product management or corporate strategy, fields that are very different from what I do now. The opportunity of networking with like-minded individuals, building friendships and networks, travelling the world, engaging in thoughtful discussions, and learning about business concepts that I am highly curious about, are things that greatly excite me. Accepted: Do you have a plan B in case you don’t get in to b-school this year (I’m sure you will, but hypothetically…)? Embeeay: I do not deny the possibility of striking out for business schools; it is a possibility that I can live with. My plan B is to use what I’ve learned about myself during the MBA application process, reframe my short-term career goal, focus on finding a new job, and lean on my paychecks to soothe the emotional scarring obtained from receiving 4 or 5 rejection letters. Accepted; Why did you decide to blog about the MBA application experience? What do you hope to gain from these writing exercises? Embeeay: I decided to blog about the MBA application experience because I missed writing, I enjoy writing, and I certainly could practice writing. It’s been a natural exercise for me as I used to frequently write in journals growing up. I hope to improve my writing through the blog and to also provide a glimpse for any current or future MBA prospective students on what the process is like for one individual! I also hope to entertain any readers that happen to stumble onto my blog, MBA-prospective or not. Thanks for reading.